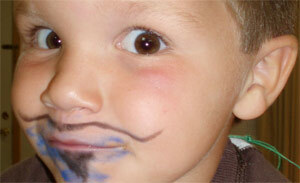 This page provides information and a variety of ideas that might be of use to play therapists. Most are in the form of brief articles. We try to add new ideas regularly, so please visit again! To access the ideas, simply click on the titles below. Electronic versions of these papers and chapters are provided as a professional courtesy to ensure timely dissemination of professional work for individual and noncommercial purposes. Copyright and all rights therein reside with the respective copyright holders, as stated with each chapter or article. These files may not be reposted without permission. 2011: Issue 65, pgs 16-19. Reprinted with the generous permission of the British Association of Play Therapists. 2011: Issue 66, pgs 7-10. 2011: Issue 67, pgs 18-21. Volume 4, Issue 4, December 2009. Reprinted with the generous permission of the Association for Play Therapy. © 2010, Play Therapy Press. All rights reserved for articles and photographs. Flour mixture: 2 1/4 cups flour and 2 Tbs. powdered alum (optional) in a mixing bowl. After adding heated mixture, add 1 Tbs. salad oil. Stir all together in bowl as fast as you can. When you cannot stir anymore, put on board and knead until mixed well. The play dough does not need to be refrigerated. It may be stored in a wide-mouthed jar with a tight lid or in a sealed plastic bag. Developed in the early 1960s by Dr. Louise Guerney and Dr. Bernard Guerney, Filial Therapy is a highly effective psychoeducational family intervention in which parents serve as the primary change agents for their own children. The therapist trains the parents to conduct special child-centered play sessions with their own children, supervises these play sessions, and eventually helps parents transfer the play sessions to the home setting. The therapist helps parents understand their children more deeply, explores parents' reactions and issues, and guides parents in problem-solving. Children benefit greatly from the play sessions, and parents gain skills and confidence in the complex tasks of childrearing. Filial Therapy can be used as a prevention approach as well as an effective intervention for a wide range of child/family problems: oppositional behaviors, anxiety, depression, abuse/neglect, single parenting, adoption/foster care, relationship problems, divorce, family substance abuse, toileting difficulties, trauma, family reunification, chronic illness, etc. (Please see the Books & Articles page of this website for more information). • cars, trucks, police cars, ambulances, firetrucks, school buses, etc. Because parents eventually conduct filial play sessions at home with their own toys, the filial therapist develops a modest playroom. Extravagant playrooms can unintentionally create pressures on parents to "compete," or may set the children up for disappointment when they begin their home sessions. Ideally, the filial therapist would have a playroom and an observation area with a one-way mirror. This is particularly useful with filial therapy groups. Since most of us do not operate under ideal conditions, an alternative is discussed here. If you have a single room, it can be divided into a play area and an observation area. 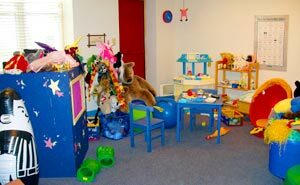 (The observation area is used by parents who watch the therapist's play session demonstrations and by the therapist as he/she supervises the parent-child play sessions.) In essence, the observation area is delineated by furniture arrangement. For example, a desk or table can be placed at the end of the room or across a corner with one or two chairs on the non-play-area side. The desk or table would be considered "off limits" to the child during the play sessions and could be handled with an initial explanation to the child and by normal limit-setting thereafter. My current playroom uses about 2/3 of a room. I've placed a dress-up chest and a toy cabinet across the open end of the room. Once the child enters the play area, I (or the parent) place a child-sized chair in the opening we've entered through. On the non-play-area, or observation, side (the remaining 1/3 of the room), I have a small desk and chairs. It's clear by this furniture arrangement that the observers are divided off from the play area. Even though the therapist is in the same room, clearly visible to both parent and child during their filial play sessions, I have found that children are rarely distracted by this. 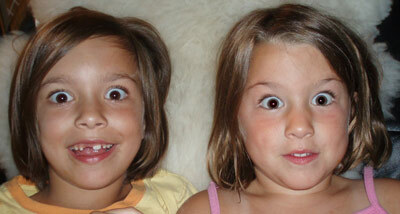 Occasionally, children may turn to the observing therapist and ask a question. When this happens, I tell them to check with their parent (affirming the parent's authority over the play session). I also use peripheral vision as much as possible while observing so that I remain as unobtrusive as possible. If you have extremely limited space and cannot have a permanent play area, you might want to try this idea shared by a therapist who attended one of my workshops (I don’t recall her name, or I’d give her credit!). She placed a blanket on the floor and the toys on the blanket. The boundaries of the blanket became the physical boundaries of the play sessions. When the play session was over, she simply folded up the blanket with the toys inside and placed it in a closet until it was next needed. In Filial Therapy, parents eventually hold play sessions with their children on their own at home. We recommend that they use a separate set of toys for these sessions to help communicate the "specialness" of the play sessions to the child. 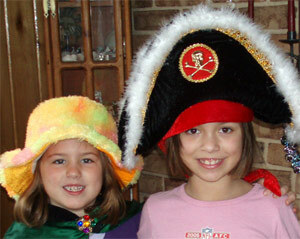 This brief article discusses ways to help parents develop a separate toy kit for this purpose. Early in Filial Therapy, I provide parents with a list of toys similar to the one above. I ask them to try to assemble these toys over the next several weeks. I explain that they needn't get everything on the list, but to try to obtain toys from each of the various sections. As they near the point where they will be conducting play sessions on their own, I then remind them again of the need for a separate kit of toys. It's fine if there are a few "cross-over" toys, i.e., toys which children use in everyday play, but it's best to minimize this. Common "cross-over" toys might be a dollhouse or other fairly costly items that can't easily be duplicated. I suggest that parents keep the toys in a bag or box in a location that will not be tempting for curious children. Although the cost of a "starter" play kit is probably about $150, that's a great deal of money for some. Indigent families need alternatives to purchasing lots of brand new toys. Parents and workshop attendees with whom I've worked have suggested many creative ways to assemble these toys. Their ideas and some of my own are outlined below. • Other common household items - think creatively! • Socks with yarn hair, button eyes, etc. For homemade items, it's fine to have the parents and children work on creating their play session toys together. For example, the parent and child could jointly color the box that will be used as a dollhouse, or draw the features on sock puppets. With filial therapy groups, it can be fun to have a toy-making night. It's a nice way to draw out parents' creativity while developing the toy kit. It can also be useful to create some toy kits to loan to parents for their home sessions. It's nice if parents contribute some of the toys, but the rest can be loaned to them and returned after they've finished having home sessions. Toys for these kits can be obtained quite inexpensively from yard sales and flea markets. You can also circulate a list of needed toys among coworkers (and other family members' coworkers) and collect needed items. Some child- or toy-related businesses are willing to donate toys for such purposes. I've also approached charitable organizations, presented a brief "seminar" about play therapy and filial therapy, and then asked them to consider a donation for these toy kits to be loaned to indigent families. For example, when I worked in a community mental health center, I gave a talk to a local charitable business organization that resulted in much interest about play therapy and a $2000 check for toys for our in-home filial therapy program! Ideas for developing toy kits are bounded only by your own and your clients' creativity. I've found that the more you keep an eye out for ideas for toys, the more creative you become! People have engaged in storytelling for centuries, long before recorded history. It's a way to pass along cultural and family practices and values and to create social bonds through a common history. 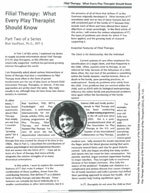 Various types of storytelling techniques have been employed in child therapies (VanFleet, R. (1993). Strengthening families with storytelling. In L. VandeCreek, S. Knapp, & T. L. Jackson (Eds. ), Innovations in Clinical Practice: A Source Book, Vol. 12. Sarasota, FL: Professional Resource Press, 147-154.). Personal storytelling involves the sharing of actual memories in individual or group/family therapy. Described here is one way of using personal storytelling with a family in therapy. I ask the family to relax (closing their eyes is encouraged, but optional). I then ask them to think about a favorite toy or object from their childhood. I slowly take them through some simple imagery, asking them to think about what the toy looked like, how large/small it was, what it smelled like, where it came from, how they played with it, how they felt when they played with it, any special experiences they had with it, what happened to it, etc. etc. Almost invariably this activity evokes memories and feelings, usually quite pleasant. Next, everyone takes turns sharing their memories of their favorite toys while the others listen. The therapist can use the storytelling to help family members understand each other and themselves better, and sometimes can relate their stories to current-day reactions or feelings. After each family member has shared his/her story, the therapist asks them what the storytelling experience was like for them and guides them as they briefly process the activity. I use this activity, not for in-depth analysis or insight, but more to bring families together in a meaningful sharing of their lives. It should be noted that sometimes sad or angry feelings can be evoked during personal storytelling, and the therapist needs to leave adequate time for the family to discuss and work through these feelings. When there are young children in the family, the therapist can invite them to tell a story about their current favorite toys. A subsequent "show and tell" session, if family members still possess the toys can be fun as well. School settings present many unique challenges to counselors using play counseling methods. Space and time are often limited. Counselors may work in several schools and therefore must carry their toys and materials with them. Children usually must return to the structure of a classroom immediately after sessions. Time can be seriously limited, and counselors may be responsible for large numbers of children. 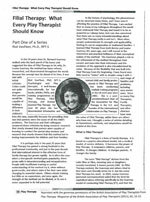 This brief article addresses issues in the selection of play counseling methods, given these considerations. Short-term, directive play counseling methods are increasingly popular because they are effective and they fit more readily within the restrictions imposed by the school setting. There are times, however, when it would be beneficial to use nondirective play approaches, such as when the counselor is unsure of what's really going on with the child, when children resist the direction of the counselor, when there are serious "control" issues, etc. Many have found nondirective techniques valuable in establishing rapport with "hard-to-reach" children. Some school counselors have found the following ideas that combine nondirective and directive approaches to be feasible and effective. If time is limited with a child, e.g., if a counselor usually has only 6 half-hour sessions allotted per child, it is best to let the child know that at the start. (The counselor must decide if the needed work can be accomplished within that time frame or if an outside referral is needed.) Using poker chips, check marks on a chart, or tickets to show the child how many sessions are left each time helps make it concrete and more understandable for the child. Children often have a remarkable ability to do their "work" within boundaries such as these. At the very least, this gives the child the option to determine how much to reveal/work through during the allotted time. When combining nondirective and directive play counseling methods, it's extremely important to ensure that the child knows the difference. This prevents confusion for the child and keeps their play communication as open as possible. Ideally, it's best to hold nondirective play counseling in a different area from the directive play counseling, but very few school counselors have that luxury. Another way to handle this it to tell the child something like, "For the first part of today, YOU may select the toys and how you'd like to play with them; in the last part of today, I will select the activities." When changing from nondirective to more directive play, it's helpful to give the child a chance for closure in their nondirected play ("Laura, you have one more minute left in your playtime before I select an activity for us.") and then to reiterate, "Now we're going to do something I've selected." when starting the directive portion of the session. Most children seem to respond well to this arrangement. Is it better to start with the nondirective or with the directive techniques? Although there might be exceptions, I generally suggest that school counselors start with nondirective, child-centered play counseling and end their sessions with more directive play counseling. There are two main reasons for this: (1) Starting with the nondirective play gives children a chance to relax and permits freer expression of their own issues at the start of the session. It's the child equivalent of the adult counseling lead-in, "Tell me how things have been going for you lately." (2) Children usually must return from counseling sessions to quite structured classroom settings. Ending with more directive play interventions helps them make that transition more easily. With the difficult problems school counselors face these days, it's important that they have access to as full a range of counseling methods as possible. Although circumstances sometimes prohibit the use of nondirective (child-centered) play counseling, counselors usually can incorporate it as needed using some of the suggestions above. While there are many wonderful ideas described in the growing number of play therapy books, it can be both helpful and rewarding to develop your own creativity and spontaneity with play therapy ideas of your own. Even if you primarily use child-centered play therapy, there are times when you may need some additional interventions (make sure to keep the child-centered play sessions and directive techniques clearly delineated for the child, though!). The following set of questions can help guide your thinking as you try to design a play therapy intervention for a child or family or specific problem. Determine the therapeutic goal(s) with the child/family. What "traditional" methods of therapy might apply to this problem/goal? What does each "traditional" method in #2 aim to do? How could these be made playful? • artwork or craft creations? Take as an example a 5 year old girl who is stung by a bee in the front of her house and her fear generalizes to the front porch and front yard. She refuses to leave the house through the "bee way" (front door). She throws tantrums whenever her parents suggest she try going out the front door. Her need to use the back door at all times is time consuming and somewhat of a nuisance to the rest of the family, and her parents realize that allowing her to use only the back door may only be reinforcing her fear and behavior. The goal would be to help her become comfortable using the front door, front porch, front yard again. Traditional methods? First, it would be important for the parents to determine if there were any hives or nests belonging to "stinging creatures" in front of the house, and to have them removed (common sense). Second, we might use systematic desensitization to help her overcome her "phobia" or fear. What does SD aim to do? By helping the client learn a response incompatible with her fear (i.e., relaxation) when in the presence of the stimulus, the therapist helps the client become desensitized (less afraid). This is done in a hierarchical fashion until the client is able to face the actual feared stimulus (the front of the house) without experiencing the fear. The "Be a bee" game could be played (rehearsed) for several sessions, perhaps having the child teach her parents how to "be a bee" as well. Eventually the game could be tried in vivo, either with the therapist present at the home, or with some training so the parents would know how to handle the in vivo attempt. Here's how one family handled it: They made their own bee puppets using yellow socks, black magic markers, and pipe cleaners. They then let the "queen bee" (their daughter) lead the way out the front door, with the entire family buzzing along behind her. They kept it light with lots of laughing, just as they had learned during the therapy sessions, and after a week of family buzzing, their daughter grew tired of the game and no longer needed assistance in using the front door! Client resistance to therapy can pose serious challenges for the mental health professional. One step, among many, that we can take involves examination of our own attitudes about resistance (for a full discussion on the topic of resistance, please see the Play Therapy Videos page). Reprinted below is a brief article which can help us redefine resistance in a way which increases our likelihood in handling it effectively. Psychological research and common sense suggest that it's important for people to feel in control of their lives. When control isn't possible, predictability is a characteristic that helps people cope with and adapt to situations. When families encounter problems with their children and/or their relationships with each other, they often feel as though they have little or no control over their home lives. Furthermore, American culture emphasizes the value of independence and the ability to handle one's own problems. Some families may perceive attendance at therapy as a very visible reminder that they are unable to handle their own problems as they "should," and that there is something "wrong" with them. This creates an atmosphere where resistance is possible, and the negativity of this climate can be compounded by misrepresentations of therapy in the media and even by some therapists. The purpose of therapy is to help families change. Although families may dislike the problems which have brought them to therapy, there are at least some elements of predictability to the problems (e.g., although Freddie may misbehave, which may seem out of the family's control, at least his misbehavior is somewhat predictable for them). The changes suggested by a therapist sometimes seem like a leap into the unknown, which has no predictability at all for the family. If therapy helps Freddie change, he may no longer be as predictable, and if therapy focuses on parents' changing, they may feel lost in foreign territory. (The predictable nature of the problem may be preferable to the positive, but unpredictable offerings of therapy.) Regardless of the situation, families often resist change in order to restore their home life to it former, more predictable state. Considering these dynamics, resistance can be seen as a natural outgrowth of the change process. Expecting resistance as a natural part of the therapeutic process can help practitioners to handle it more effectively. Therapists and change agents often become frustrated with the resistance they encounter, sometimes assuming that parents or family members are deliberately trying to sabotage therapeutic efforts. While this can be the case, it is rare. When therapists view resistance as something that needs to be eradicated, they may unintentionally set up antagonistic relationships that are inconsistent with the changes they are trying to facilitate. Instead, it can be helpful for therapists to alter their expectations: to think of resistance as a natural part of the change process and as an expression of parents' or family members' unmet needs. This view of resistive behavior is more likely to help therapists select helpful interventions. Family members who seem reluctant to embrace therapeutic changes may be expressing their need for a greater sense of control or predictability, fears about losing control or independence or status, anxiety about adopting new roles or behaviors which are not yet clearly defined for them, doubts about their own ability to carry out changes, concern that the changes might result in a weaker rather than a stronger family, and other reactions. If therapists can determine and understand the needs that are being expressed through the resistance, they are in a better position to help families overcome their reluctance to make changes. Frank discussion of family members' concerns should be encouraged. It is important for therapists to listen without judging family members' reactions in order to maintain open communication. Patience is also essential. A climate of understanding can set the stage for more collaborative working relationships with even quite challenging parents. When trying to help parents or other professionals understand play therapy, I've often guided them as they examined how their own culture or subculture has viewed play. Although I'm sure some cultures may be more lighthearted and others more serious, since play is a universal phenomenon among children, there's usually something to be learned from examining its role in one's own upbringing and/or social world. There are many different ways to think of culture. Different countries have different cultures. “Culture” can be strongly related to one’s race, religion, ethnic heritage, and even generation or age. But there is often great diversity within these broader categorizations of culture. Each family has its own customs, beliefs, and practices that could be viewed as the “culture of that family.” Families are embedded in neighborhoods and communities that have cultural influences. Even our socio-political environment affects culture. In graduate school, I was deeply influenced by a child development course in which we examined the “culture of childhood” that shows how some games and practices are passed along from one generation of children to another without adult intervention! In this brief article, I am thinking of culture from these broader perspectives. One of my great joys in life is getting out into wilderness areas and hiking or photographing wildlife in their natural world. 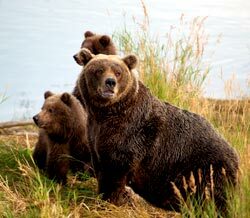 That interest, plus the fact that some of my favorite relatives live there, has taken me to Alaska on many occasions. I have been fortunate to learn a little about the Native Alaskan cultures and heritage there. Several years ago, I had the unique opportunity to attend one of the Inupiaq Eskimo shareholders' meetings in March. Prior to the business meeting, several hours were spent in playful activities and games including dogsled races and Eskimo football (a game in the snow for men and for women that seemed to me to have one primary rule—players must wear mukluks!). The games involved the entire community from children to elders. The sense of community and celebration was wonderful to me, and that cohesiveness then seemed to carry over into the business meeting that entailed discussion of some very serious and difficult topics. On another winter trip, I took part in a traditional blanket toss. In their native language, they began by saying something like "we are the community" (they translated from their native tongue for us non-natives). They taught us that the object of the blanket toss was to get the person high into the air and then help them land on the blanket (actually a hide) on their feet. That happens only if everyone is cooperating. Everyone must pull the "blanket" back with the same amount of energy. If one side is pulling harder than the other, it's likely that the person being tossed will lose their balance when they land. If everyone pulls together more equally, a successful landing on the feet is much more likely. The tosses are accompanied by noisy encouragement as everyone learns to work together for the same goal. Success in this "game" requires cooperation rather than competition. And that value seems to parallel that of the Native Alaskan cultures for thousands of years, where survival in a harsh environment has depended upon cooperation and sharing. As a Filial Therapist, I was struck by the consistency of these values with those of the Filial Therapy method! We have similarities and differences with all of our clients, and it is through respectful dialog with our clients about their cultural experiences and their attitudes toward play that we can develop a therapeutic partnership that is much more likely to serve our clients well. It has been enjoyable and informative for me to learn more about families’ play experiences, and I believe their reflections on the topic have helped them understand more about the value of play in their children’s and their own lives. I would recommend the work of Dr. Brian Sutton-Smith to those interested in this general topic! It can be an interesting and informative journey to explore the development of one's attitudes about play. Taking the time to do so in the context of the parents' own experiences and family’s culture and heritage can help them understand why play therapy might be a beneficial treatment for their child or family. It can also help us to understand our clients' uniqueness and the special experiences--good and bad--they bring to the therapy process. If you go to the Parents' Page of this website, you'll find a section on how parents and caregivers can help children through traumatic events. I've also included there a list of signs to watch for that might indicate that a child has been traumatized. Since many of us are involved in treating children who have been exposed to trauma, either directly (or indirectly through the news media), I thought it might be helpful to have a few resources at our fingertips. The list below is far from exhaustive, but I've found these resources to be useful. Brave Bart by Caroline Sheppard (illustrated wonderfully by John Manikoff) is a wonderful children's book about trauma and grief. 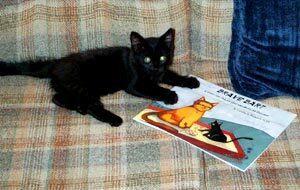 Bart is a cat who has been through a "very bad, sad, and scary thing." He has some post-trauma symptoms, which are explained in simple language in the book, and then he explains how he was able to overcome them. I particularly like this book because it does not label what the bad, sad, scary thing was, so it can be used for children experiencing all kinds of trauma. Children have responded exceptionally well to this book, and it is probably my favorite children’s book about trauma. When Something Terrible Happens by Marge Heegaard is a workbook for children (useful with adults, too) that helps them express their feelings about a traumatic event and helps them determine coping strategies. It "walks them through" the process of grieving and recovery. There is space for children to draw, color, or write in response to a question or cue on each page. This book, also, does not specify the trauma and can be used for many different situations. Too Scared to Cry by Lenore Terr is an important resource book on how children respond to trauma. Based upon her research with the child survivors of the Chowchilla bus kidnapping and many other trauma cases, the book provides a close look at the signs of trauma reactions and the devastating and lifelong impact trauma can have if unnoticed or untreated. This is one of my favorite books for professionals who work with children and trauma. Play Therapy for Psychic Trauma in Children by Charles Schaefer (a chapter in the Handbook of Play Therapy, Vol. 2) provides excellent information about the impact of trauma on children and how play therapy can be used to treat it. Rubble, Disruption, and Tears: Helping Young Survivors of Natural Disaster by Janine Shelby (a chapter in The Playing Cure) provides excellent information about the impact of natural disasters on children and how play therapy can be used to treat it. Much of the information is also applicable to man-made disasters and other traumatic events. Her focus on developmental aspects of trauma intervention is excellent. 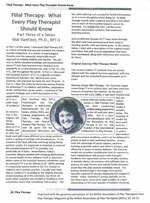 Filial Therapy for Children Exposed to Traumatic Events by Risë VanFleet and Cynthia Sniscak (a chapter in the Casebook of Filial Therapy) discusses the value and application of filial therapy with children and families experiencing traumatic situations. It includes adaptations to the filial therapy process for this population. Another source of information is the National Institute for Trauma and Loss in Children, based in Michigan. Most of the resources listed above are available from a variety of sources, but I know that the Self-Esteem Shop carries them, as well as other useful materials. They can be reached at www.selfesteemshop.com or at 800-251-8336. Play therapy and filial therapy can be extremely helpful to traumatized children and families. They should be conducted only by professionals with appropriate training, supervision, and experience, however. The Family Enhancement & Play Therapy Center offers trainings and consultation/supervision on the use of these approaches for trauma. 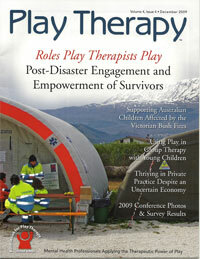 A new book, Play Therapy for Traumatic Events by Drs. Risë VanFleet and Heidi Kaduson, is in process. Filial Therapy was created in the early 1960s by Drs. Bernard and Louise Guerney, and extensively researched and developed by Dr. Louise Guerney and others for the past 40 years. Filial Therapy is a psychoeducational intervention in which the therapist trains and supervises the parents as they hold special child-centered play sessions with their own children (ages approx. 3-12), thereby engaging the parents as partners in the therapeutic process and empowering them to be the primary change agents for their own children. A combination of family therapy and play therapy, Filial Therapy aims to eliminate presenting problems, improve parent-child relationships, and strengthen the family system as a whole. Filial Therapy has been used successfully with many child/family problems: aggression, anxiety, depression, abuse/neglect, single parenting, adoption/foster care, relationship problems, divorce, family substance abuse, oppostional behaviors, toileting difficulties, attentional problems, trauma, chronic illness, step-parenting, multi-problem families, etc. Filial Therapy has been researched a great deal. This summary outlines the results of published and unpublished research, including academic research, doctoral dissertation research, and data collected in community mental health and independent practice settings. VanFleet, R., Ryan, S.D., & Smith, S.K. 2005. Filial Therapy: A Critical Review. In L.A. Reddy, T.M. Files-Hall, & C.E. Schaefer (Eds. ), Empirically-Based Play Interventions for Children (pp. 241-264). Washington, DC: American Psychological Association. I have posted some information about credentials on the Parents section of this website. The information below is provided to help professionals determine how they can develop their knowledge and skills in the field and some of the credentials that are available. Most of the information provided relates to play therapy education and credentials in the United States, although I’ve included a little information about international opportunities. Although there are a few graduate programs and post-master’s qualifying courses in the United States and other countries that offer significant numbers of courses in play therapy, it's more common for a college or university to offer just one or two courses, if that. There seem to be more courses being offered as the demand for play therapy education increases, but it's still difficult to find substantial university offerings. (If you're considering graduate education that would provide a great deal of play therapy, please contact the Association for Play Therapy in North America or the British Association of Play Therapists in the United Kingdom. As I become more familiar with other countries’ play therapy training options, I will try to update this information here (also, please watch our International page for information about this). I expect this will continue to change for the better, but it will take time. Most people take what courses they can during their graduate programs and pick up the bulk of their play therapy education from workshops and conferences--either during or after they've completed their university training. I usually recommend that people pursue their master's or doctorate degrees in programs that increase their ability to practice independently (if that's a goal for them). In the U.S., each state has its own licensing laws, so it's best to research which types of degrees are eligible for licensing in your state. For example, most states license doctoral level psychologists; some license master's level psychologists. Most states seem to license master's level social workers; some (but not all) states license counselors and marriage and family therapists. It is the license in these broader professional categories that permits you to practice independently (within the scope of the license). Play therapy is considered a specialty within these broader areas, so there's no "state license" to practice play therapy. (You can become a licensed psychologist or licensed social worker who specializes in play therapy, however.) In some countries, there IS a separate “license” or credential as a play therapist that is comparable to a psychologist, counselor, or social work license. There are several credentials that play therapists in the U.S. can pursue to demonstrate to the public and other professionals that they have received special training in play therapy. The Association for Play Therapy offers the "Registered Play Therapist" and the "Registered Play Therapist-Supervisor" credentials. Being an RPT or an RPT-S means you have achieved a certain level of training and supervision in play therapy. If you are (or will be) a master's level mental health professional who seriously wants a career in play therapy, I'd suggest you contact the Association for Play Therapy and request their full application packet to become an RPT. You will be able to see the types of training, supervision, etc. that are required. Other organizations, including my own, offer other play therapy credentials. Each of these is designed to show that you have achieved at least a minimum degree of training/supervision in the field. The "Filial Therapy Certification" that is offered by the Family Enhancement and Play Therapy Center is a specialty certificate program. (Many of the requirements overlap with those for the Registered Play Therapist, so you can work on the two different credentials simultaneously.) This certificate, described elsewhere in this website, is specifically for professionals who use Filial Therapy and wish to demonstrate their experience and competence in that arena. I usually recommend that play therapy professionals consider working toward the RPT credential, developing their sub-specialty credentials either at the same time or after receiving the more general play therapy credential. Others may find it beneficial to earn the Filial Therapy Certification initially—it simply depends on your professional goals. Perhaps you're not interested in all this "credential" stuff. In that case, you're still free to pursue further education in play therapy from workshops and conferences. Increasing numbers of organizations are offering play therapy training throughout the world. A few distance-learning opportunities in play therapy are available now, and I expect that will increase in the coming years. Play therapy is gaining international momentum, probably because it works so well, and educational opportunities in the field are bound to increase. By early 2006, this website will include information about an international collaborative organization that will provide more information about play therapy and filial therapy throughout the world. Throughout the U.S., school counselors, especially at the elementary and middle-school levels, are increasingly using play counseling to help students overcome obstacles to learning. One of the primary reasons for this is the efficiency and effectiveness of this type of counseling. This monograph provides a basic description of play counseling, the rationale behind it, the various forms it can take, and the research that has clearly demonstrated its effectiveness. • remove emotional and behavioral obstacles to learning. In essence, play counseling stems from the broader field of play therapy, but tends to use the shorter-term interventions that are appropriate to the education-related goals that school counselors work toward with identified students. Until students are approximately 12+ years old and develop the ability to use cognitive reasoning more fully, they tend to process information and develop their physical, mental, and social skills through their use of imagination and play. Although child students can talk and “reason” to some extent, their primary way of understanding the world is through their playful interactions with it. Play counseling is developmentally-attuned because it capitalizes on these mechanisms. When confronted with problems that interfere with their learning, students frequently become resistant, withdrawn, ashamed, oppositional, helpless, defensive, etc. Play counseling provides an excellent way to avoid or overcome these emotional obstacles to progress. There is considerable research that shows that children learn best in hands-on, activity-based, and playful situations. Play counseling creates those types of learning opportunities in order to reach its goals. Play counseling can be used in conjunction with other counseling methods, such as behavior management, parent and/or teacher consulting, classroom guidance, outside therapy. Because of its developmental and learning focus, play counseling is more likely to address the root cause(s) of student problems. There are many different types of play counseling, but most school counselors select methods which are relatively short-term and focused on the more specialized goals of a school guidance program. For example, Adlerian play counseling and cognitive-behavioral play counseling approaches are commonly used in schools. Shorter-term forms of child-centered play counseling and social skills interventions are also effective. Dramatic play counseling is a form of behavioral rehearsal that helps students learn to behave more assertively or prosocially, as needed. Play counseling offers individual, group, and classroom formats that are easily adapted to meet specific student and school needs. A considerable amount of research has been conducted on the effectiveness of play counseling. Results show quite consistently that it typically yields significant positive changes in children/students. For example, one study showed that children with ADHD improved in nearly all problematic areas following a systematic set of interventions using play counseling. These improvements carried over into “real life” and were noted on commonly-used teacher and parent rating measures. A recent meta-analytic review of play therapy and play counseling research has shown it to be very effective in addressing child and student problems. Because students can develop new skills, new ways of interacting, and new attitudes through play counseling, its results can be long-lasting. Of course, the results are much stronger when the counselor keeps teachers and parents informed of progress and assists them with other interventions that might be useful in the classroom and at home. A “team” approach can enhance any school counseling program. 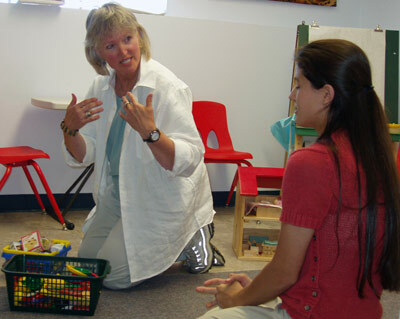 In schools where the counselor initiates the use of play counseling, it is quite common for teachers to comment to the school counselor, “I’m not quite sure what you’re doing, but it’s working!” Play counseling does not solve all problems, but it represents an effective intervention that school counselors are employing more and more frequently. Play counseling helped an anxious, perfectionistic student take more risks in her schoolwork, improving her performance which had suffered from her excessive fear of making mistakes. Play counseling helped a disruptive student cope more effectively with his angry reactions to his parents’ divorce so that his outbursts, “talking-back,” and general “acting out” on the playground, on the bus, and at lunch were virtually eliminated. Play counseling has been extremely effective in the aftermath of several high profile and tragic school violence incidents. It has been used to help students express their fears and other reactions to such events and to return as much “normalcy” to the school environment as quickly as possible. Play counseling has been used to help a selective-mute student talk with her teacher and participate in classroom discussions once again. Play counseling helped an entire class welcome a badly burned and scarred student back to school without undue embarrassment, while helping classmates explore their attitudes and beliefs about handicapping conditions. Play counseling has been used to help ADHD students increase attention span, stay on-task longer, and be less distractible in class.